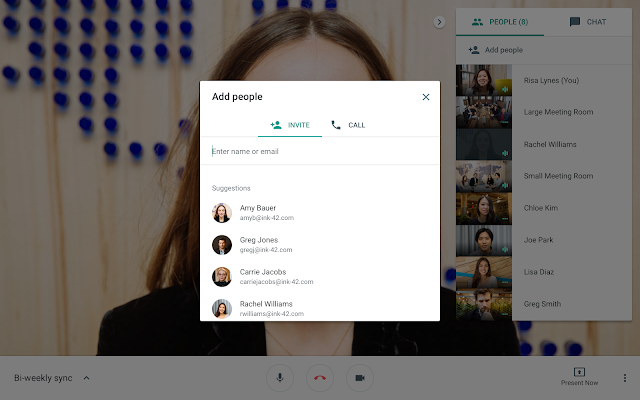 This entry was posted in Apps Feed Blog and tagged apps, Hangouts Meet, Rapid Release, Scheduled Release on April 10, 2019 by G Suite Updates. For text message, alerting is only sent out when an issue is detected, not on close. The improved alerts provide additional information to help admins proactively manage their network and devices for improved availability and end-user experience. 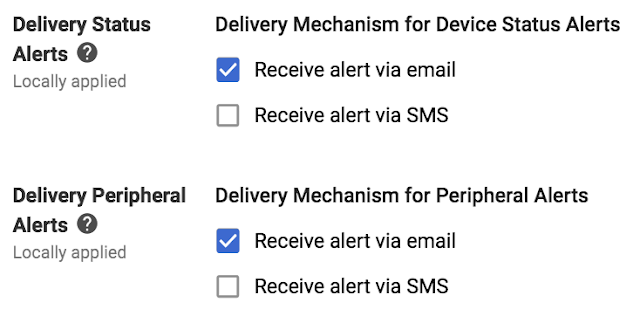 Both alert types are optional and delivery can be enabled individually by email and/or text message (SMS) (US/Canada numbers only). The email format is intended for easy integration with automated ticketing systems. Rapid Release domains: Fully rolled out to all domains. Scheduled Release domains: Fully rolled out to all domains. 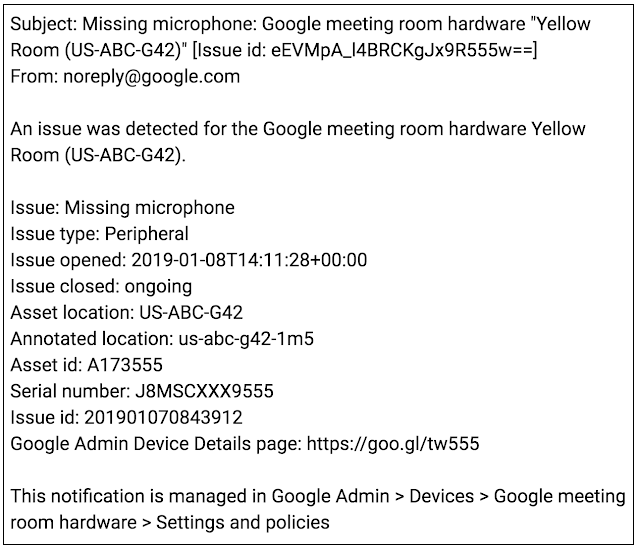 This entry was posted in Apps Feed Blog and tagged apps, Hangouts Meet, Rapid Release, Scheduled Release on March 21, 2019 by Jane Smith. Now, when you present your screen in a Hangouts Meet meeting, your camera’s video feed will remain visible. This allows other meeting participants to continue to see you while you present. 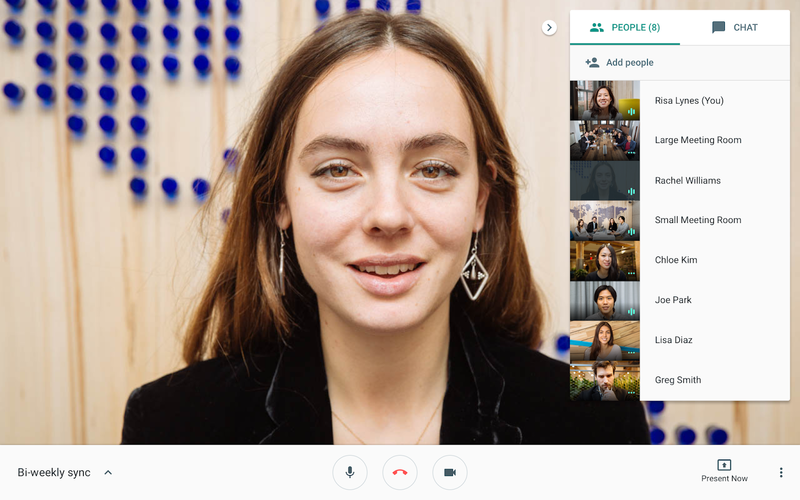 This entry was posted in Apps Feed Blog and tagged apps, Hangouts Meet, Rapid Release, Scheduled Release on March 12, 2019 by Jane Smith. 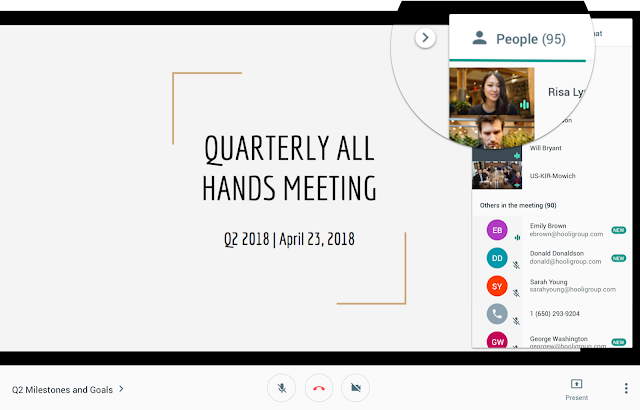 As part of the migration from classic Hangouts to Hangouts Meet that we announced last year, we’ll now begin migrating the video conferencing for your recurring Calendar events from classic Hangouts to Meet. Previously, we made the change so that new events scheduled in Calendar will use Meet. Now this change is to update previously scheduled events in Calendar as well. 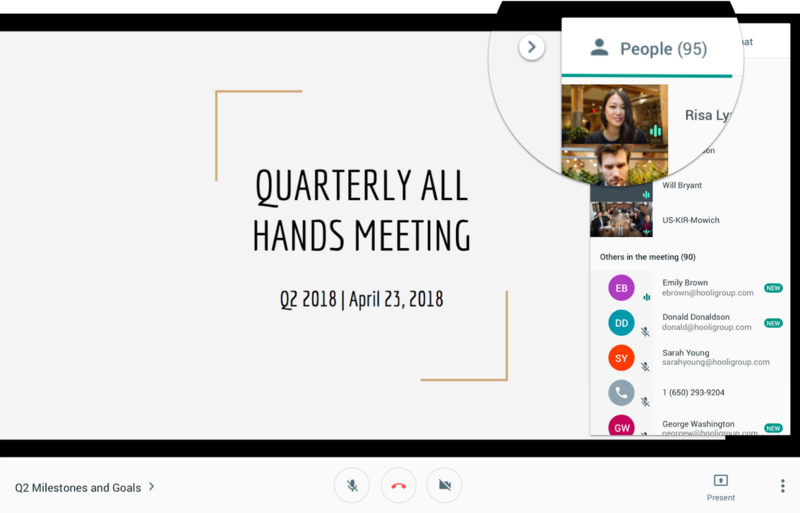 We've built Hangouts Meet to have a fast, simple interface with enterprise grade meeting functionality such as livestreaming and meeting with up to 100 people. To ensure you get the best-in-class experience we’re migrating the remainder of your existing recurring Calendar events. This will happen gradually in an effort to limit any disruption and ensure that you can focus on what’s important: meetings where people can be as productive as they are when they’re face-to-face. 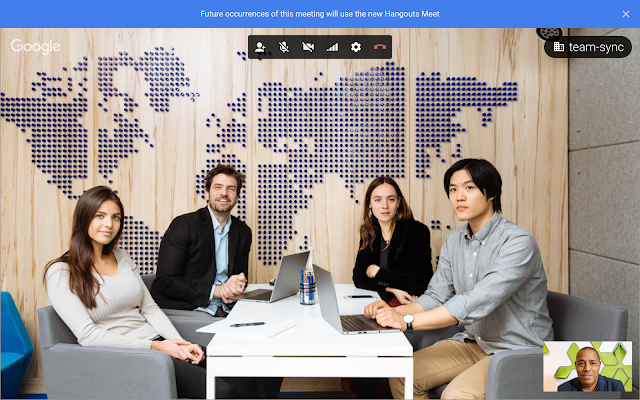 End users: When you join a recurring Calendar event on classic Hangouts, you will see a banner that future occurrences of this meeting will be on Meet. This change will take place gradually as users join affected meetings. They will see a migration banner notifying them future occurrences will be on Meet. After the end of the call, all participants will get an updated event information with the new meeting details. Single instance (non-recurring) Calendar events will remain unchanged. Some of your meetings may not automatically update to Meet. When this happens, you’ll see a banner in the video call notifying end users to update the Calendar event to Meet. This may happen for complex Calendar event setups, such as if different events have the same video link. This setting will be ON by default. 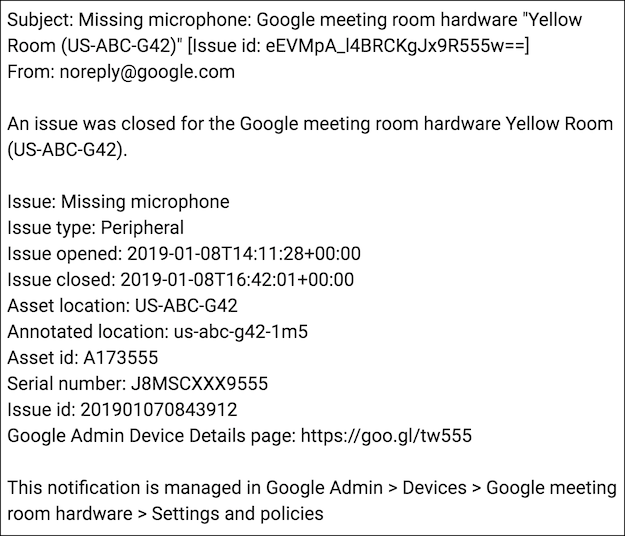 This entry was posted in Apps Feed Blog and tagged apps, Google Calendar, Google Hangouts, Hangouts Meet, Rapid Release on March 11, 2019 by Jane Smith. This entry was posted in Apps Feed Blog and tagged apps, Hangouts Meet, Other on January 31, 2019 by Jane Smith. Meet quality tool: This tool gives quick and easy access to meeting information in your domain. With that information, you can better understand what happened in a meeting and what might have caused quality issues, significantly reducing troubleshooting time. 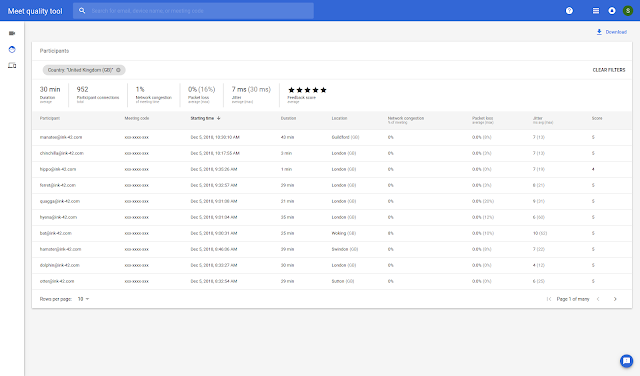 Hangouts Meet activity logs: Information about Meet usage and quality is now available to admins through Meet activity logs (in the Admin console under Reports > Audit > Hangouts Meet), enabling you both high level and detailed views on usage within your domain. Meet quality tool: Meet quality tool is designed to help you to troubleshoot your meetings. You can either look at one specific meeting or filter for a time frame, location, device or user. 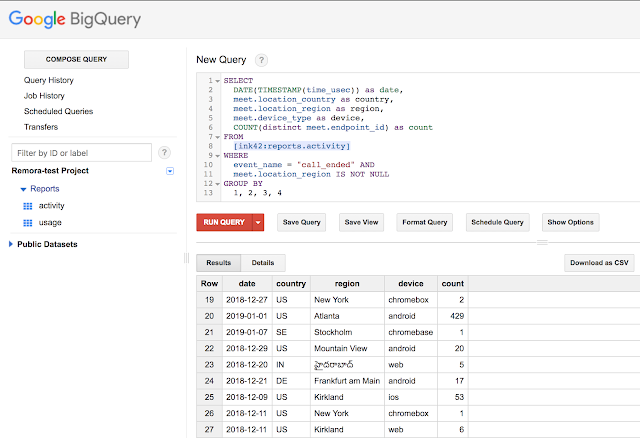 The data visible in Meet quality tool is available in the Hangouts Meet activity log (explained below) to enable further analysis. 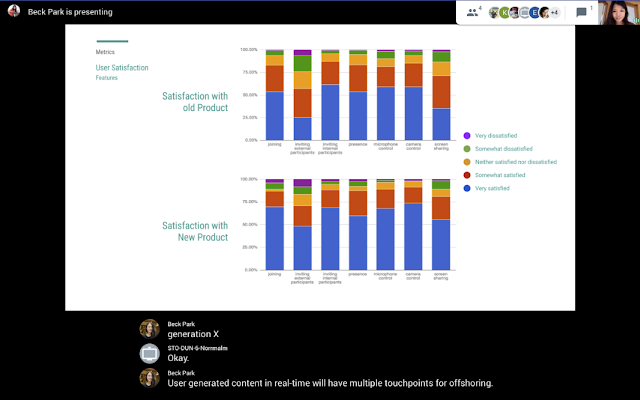 Hangouts Meet activity logs: Each time a device or a user leaves a call, an "Activity event" that summarizes usage and quality is generated. The event includes information about the endpoint (such as device type, location, IP, identifier, or call rating), its usage (such as time sharing their video, screen sharing or audio) and network statistics (such as jitter, packet loss, or RTT). Learn more about the data available in the Help Center. Is video conferencing transforming my organization (and if so, how)? Which locations communicate actively and which locations are isolated? How many minutes of video conference (VC) are run every day/week for different groups of people? Does Meet help my organization work remotely? 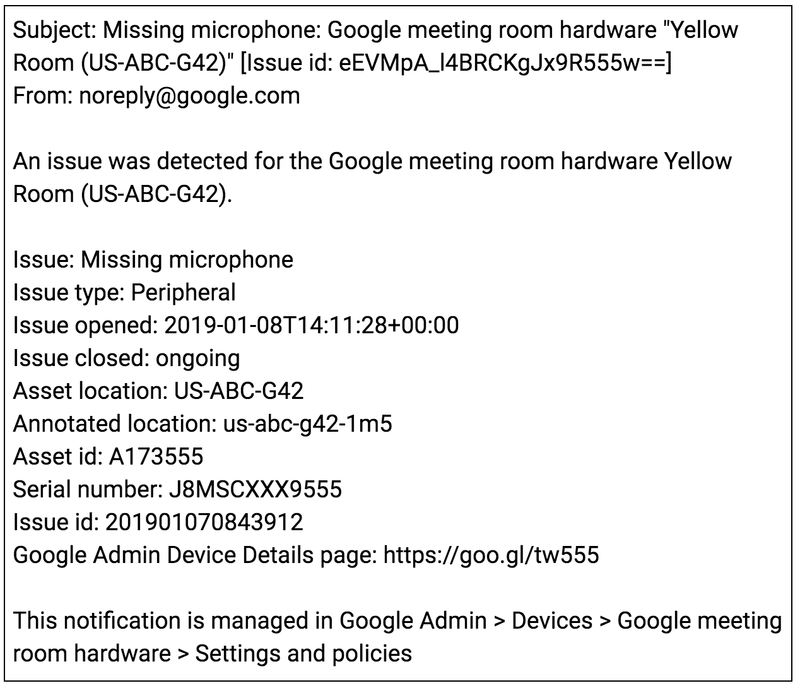 Analyze Hangouts Meet Hardware usage. How does it change over time or location? How is my network performing and what is the impact it has on video quality for my users? How do users rate the quality of the calls on my domain? Does it vary over time or per location? How much bandwidth does Meet use overall and at a specific location? Meet quality tool: To use Meet quality tool you need to be a super admin or have the correct delegated admin privilege. Follow the instructions in the Help Center to learn more about Meet quality tool access delegation. Hangouts Meet activity log: Visit the Admin console and go to Reports > Audit > Hangouts Meet. Here, you can export the data to your favorite analytical tool (using the Activity API or BigQuery for G Suite Enterprise customers) to answer specific questions you may have. Both the Meet quality tool and the Meet activity log are available to all G Suite editions. 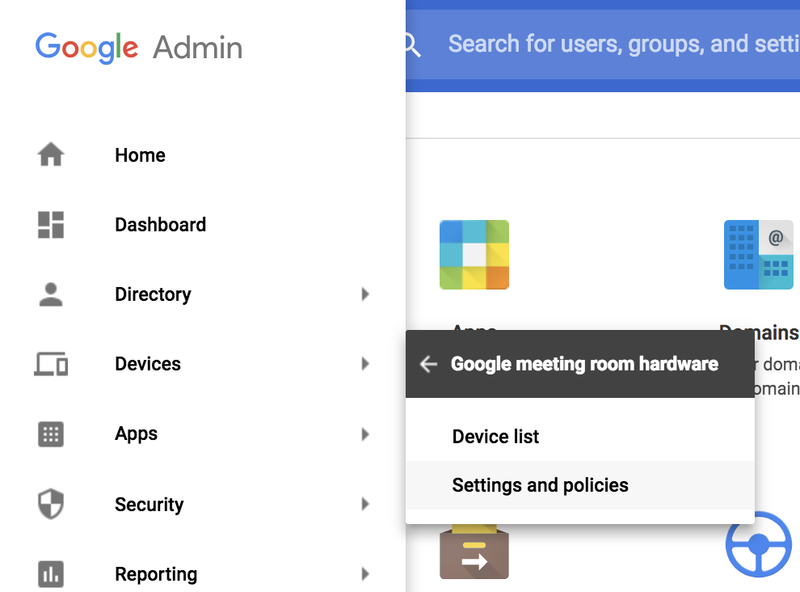 This entry was posted in Apps Feed Blog and tagged Admin Console, apps, Hangouts Meet, Rapid Release, Scheduled Release on January 22, 2019 by Jane Smith. This entry was posted in Apps Feed Blog and tagged apps, Google Calendar, Hangouts Meet, Rapid Release, Scheduled Release on December 10, 2018 by Jane Smith. This entry was posted in Apps Feed Blog and tagged apps, Hangouts Meet, Rapid Release, Scheduled Release on November 29, 2018 by Jane Smith. 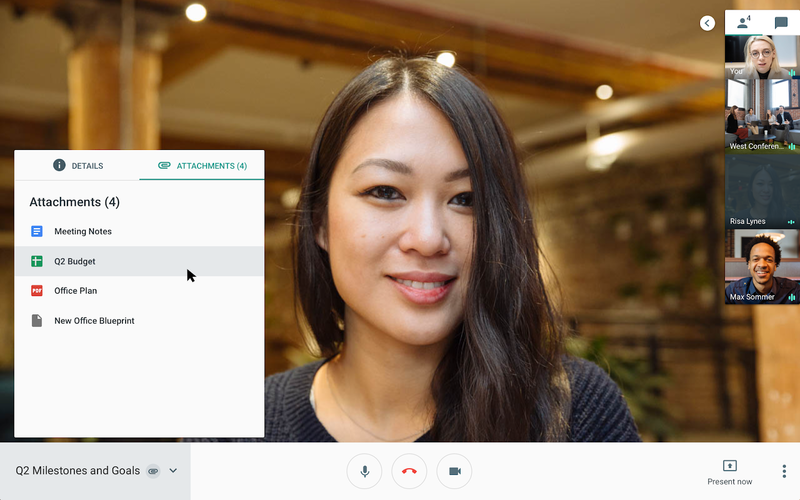 This entry was posted in Apps Feed Blog and tagged apps, Hangouts Meet, Rapid Release on November 9, 2018 by Jane Smith.